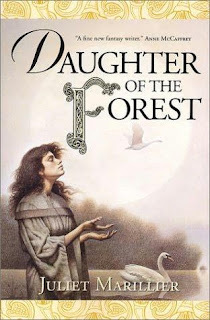 Blurb: Lord Colum of Sevenwaters is blessed with seven children but it is Sorcha, the youngest child and only daughter, who alone is destined to defend her family and protect their land from the invading Britons. For Sorcha is the only one who escapes the cruel influence of Lady Oonagh, her father’s new wife. Exiled from Sevenwaters and cast into the forest and the terrifying world beyond, Sorcha falls into the hands of the feared enemy. Now she is torn between a life she has always known and a love that only comes once. Review: I know that this book came out several years ago but I just finished reading it out loud for my mum and younger sister. They both agreed that it is the type of book that should be read out loud for the descriptions are so detailed that it is like watching someone paint a picture. I would definitely recommend this book, I have read it several times myself. It has more of the mythical feel to it and Juliet focuses strongly on the telling of the story. However that does not mean that she neglects her characters, quite the contrary. They are all wonderful and you will definitely love the good and hate the bad with a passion that makes it easy to chose sides. The main character, Sorcha, is very strong in spirit and I defiantly admire her. This is also true with the supporting characters, especially her love interest, whom I definitely would love to meet.